Provide comfort for the family of William Kidd with a meaningful gesture of sympathy. Mr. William Charles Kidd known to family and friends as “Cisco Kidd” was born in Mobile Al, on January 9, 1959 to Evelyn Poythress Kidd . He departed this life on Monday February 25, 2019 at a local hospital. As a young boy “Cisco” loved to dress, play his guitar and hang out with family and friends.“ Cisco Kidd” is preceded in death by his above parent and sister Irma Jean Kidd. 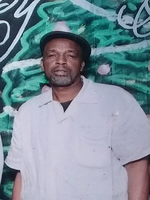 He is survived by three sons; William (Darice) Timmons, Derrick (Chalandra) Timmons and Joseph Timmons all of mobile Al ; Eight Grandchildren Destiny Timmons, William Timmons Jr, Joeqouorous Timmons, Joseph Timmons Jr , Javon Timmons, Safari Timmons, Jamiar Perryman and Willnaya Timmons, all of Mobile Al; One devoted Niece Cheryl (Lebaron) Kidd; two great nieces Neisha and Barannetta Kidd; A loving and devoted fiancée Joann of Mobile Al , and one devoted best friend Willie Chestang of Detroit Michigan; a host of other relatives and friends. To send flowers in memory of William Charles Kidd, please visit our Heartfelt Sympathies Store.